Posted April 11, 2018 by Bailey Heard & filed under Blog, FeaturedOnHomePage. 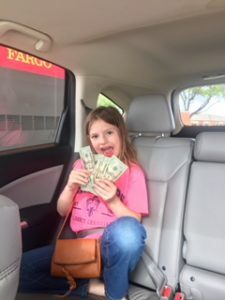 I was waiting at a stop light in Dallas last week when I asked my daughter, “Ellie, would you like to give the dollar you just earned to the man standing on the side of the road asking for money?” I adjusted my rearview mirror to sneak a peak at her precious face. Not two seconds went by before she piped up, “Actually, I do.” The man, not seeing Ellie’s little outstretched arm holding her crisp dollar bill, walked across the street and out of our view. So for the rest of the day, Ellie asked me every 30 minutes when she could go sell books. Once I got my work done, I helped her set up a table outside. I explained to her about how much each book cost and how to give change. I was assuming she would make zero sales because we do not have a high traffic neighborhood. She got antsy about five minutes into opening up shop because she, too, quickly realized no one was coming. She then had the idea that if people weren’t coming to her, then she would have to go to the people. “Mom, can I go knock on people’s doors?” It was getting kind of late and although I admired her enthusiasm and grit, I told her not this time. Inside, I was beaming with pride for my little entrepreneur who was so passionate and driven to make money. I snapped a picture of her and put it on Facebook because she was so adorable, not really thinking she might get business from it. Suddenly, my neighbor walked outside and said she saw Ellie’s picture on Facebook and wanted to come buy a book. Then a sorority sister from college messaged me after seeing the post and told me she was going to stop by, which she did, with her adorable son and they bought a book (plus two toys Ellie sold to her son from her bedroom). People kept responding on Facebook, saying they wanted to buy books from Ellie. I decided to run the payment through a PayPal link, so Ellie could get the money and learn about the entire process. She was so giddy with each new order that came in. I taught her how to package the books, how to print the shipping labels, and then how to take the books to the post office. She didn’t love the part where I told her she had to deduct money for taxes and expenses. When it was all said and done, Ellie made a few hundred dollars from selling books, toys, and her slime. She made me go immediately to the bank to get her the cash. Ellie reminded me that day how simple and fun making money can be. Sometimes we overcomplicate things or we don’t take time to think outside of the box for income making opportunities. I learned that Ellie has a gift as an entrepreneur and I want to nurture her gift and provide her with opportunities and experience to learn more about how to run a business. I want to surround her with brilliant business minds that will stretch her. Helping my daughter is going to take me way out of my comfort zone (like door-knocking), which means I will grow, too! As always, thank you so much for reading! Love and Blessings. 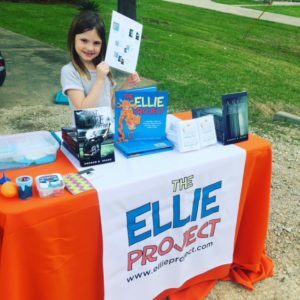 PS – When I published The Ellie Project, a book Andrew wrote and illustrated during the the final months of his life for our then two-year-old daughter, Ellie, I had no idea the impact it would have on families all over the country. The Ellie Project, along with Andrew’s other books, A Gray Faith and Your Best Life Later, continue to leave a lasting impression on the hearts of those who read them. Get your signed copies here.